Created and led by the World Heart Federation (WHF), World Heart Day aims to combat the rising of people with cardiovascular disease (CVD), the world’s biggest killer, by raising awareness and promoting the importance of living a heart-healthy lifestyle. 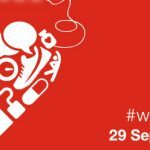 This year, on 29 September, WHF is urging people to take action by sharing heart healthy tips and attending iconic illumination events. We can all ‘share the power’ and inspire our families, friends and communities around the world to make the small lifestyle changes that can make a powerful difference to heart health. Today, CVD is responsible for claiming 17.5 million lives a year, and by 2030 this is expected to rise to 23 million. Globally, 1 in 10 people aged 30-70 die prematurely from CVD, including heart disease and stroke, but the good news is that at least 80% of these premature deaths could be avoided or postponed. Interested in learning more about international CVD interventions? Register for our upcoming breakfast seminar.